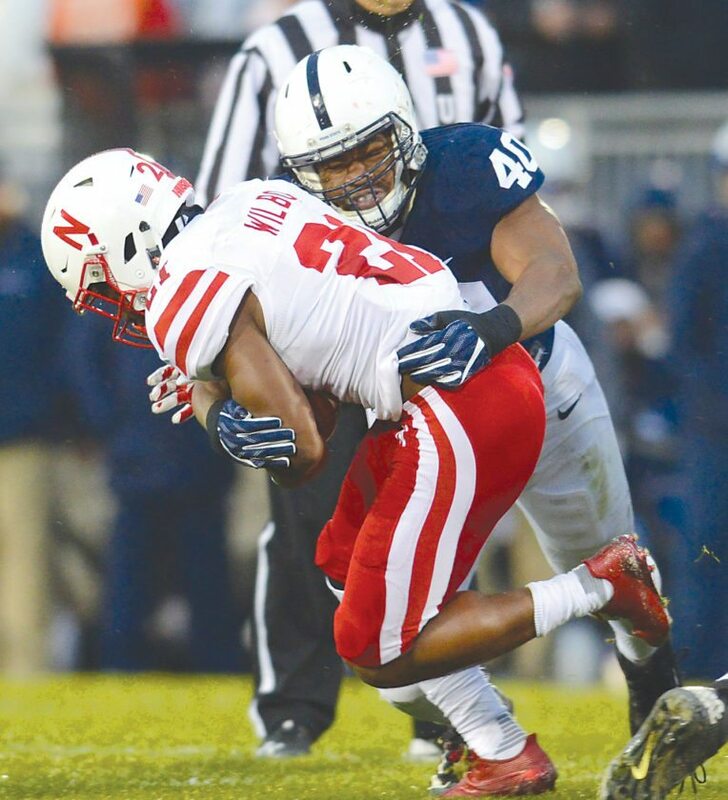 11/18/17 Patrick Waksmunski / Nebraska v Penn State / Penn State linebacker Jason Cabinda (40) wraps up Nebraska running back Mikale Wilbon (21). SCOTTSDALE, Ariz. — This is not a story about Jason Cabinda the football player. Because to describe him merely as a Penn State linebacker getting set to play his final college game is extremely limited in scope and barely scratches the surface of who he is as a person. 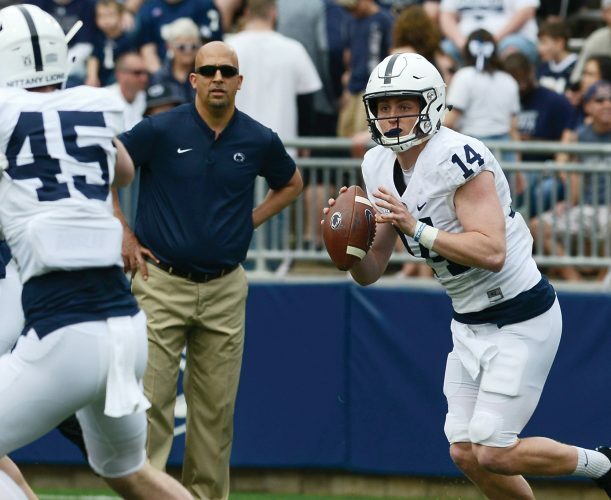 There haven’t been many Penn State football players over the years who have been comfortable speaking their minds on complex, hot-button issues such as race relations and social injustices. Most players avoid all that stuff, not necessarily because they don’t have opinions, but because they are uneasy sharing their thoughts in public. “A lot of people think it’s toxic,” Cabinda said of talking about social issues. But times have changed. More and more athletes have taken on the responsibility of shedding light on such issues, and Cabinda — one of the most respected leaders on the PSU football team — doesn’t shy away from voicing his concerns. On Dec. 8, Cabinda retweeted a graphic video of a Texas man, Daniel Shaver, being fatally shot by a police officer, Philip Brailsford, in a hotel hallway in Arizona. The day before, Brailsford had been acquitted of second-degree murder, drawing outrage around the country. “Might be the worst video I’ve ever seen,” Cabinda tweeted. A check of Cabinda’s Twitter feed shows a lot of football posts, of course, but also a large number of posts discussing social issues and problems. When he feels someone has been wronged, he’s not afraid to bring it up — whether it’s a black person or a white person. Some of his Twitter posts and retweets have ranged from slave trade around the world, to a 14-year-old Muslim girl being bullied, to even the social media mob that ganged up on Greg Schiano and cost him a coaching job at Tennessee. Cabinda is a 21-year-old African-American male, but he comes from a diverse background that allowed him to experience all walks of life. “Because of the fact that the way I grew up, I knew so many different people from different races and different backgrounds, so I’ve just interacted with so many different people that it’s easy for me,” he said. “But there are a lot of people who only grew up one way or only grew up around a certain type of people, and you’ve got to open yourself up to different things. The most important thing people can do in society, Cabinda believes, is listen. Listen to others, try and understand where they’re coming from and why they believe what they believe. “A lot of times things like this happen because you don’t understand the people that you’re dealing with,” Cabinda said. “I think when you don’t understand other people, other people’s perspective and where they’re coming from and how they grew up and things like that, it’s hard to be able to interact with them the right way. Talk to any of the Penn State coaches or players about Cabinda, and words such as “mature” and “leader” and “respect” frequently come up. They see how he conducts himself on the field and off the field, how he represents himself and the university so well, so it’s easy for everyone to hold him in such high regard. With regards to football, in college sports, there occasionally are guys who have played so much that the running joke goes something like, “He’s in his 10th year of eligibility.” Ohio State senior quarterback J.T. Barrett is one example because it seems like he’s been around forever. Cabinda is sort of Penn State’s example of that type of player. The linebacker played extensively as a true freshman in 2014 and has been such an integral part of the defense for so long that it will be sort of weird watching next season and not seeing him out there wearing No. 40 and showing his uncanny ability to get to the football. Cabinda leads the Lions in tackles this season with 84 (31 solo) and has 2¢ sacks to go along with six tackles for loss. He’s ninth on the school’s career tackles list with 278 and was a second-team all-Big Ten selection this season. Not bad for a guy who was primarily a running back in high school and still holds his school’s career record with 50 touchdowns. Having such an impact on the field has given Cabinda a forum to make an impact off of it. He’s a solid NFL prospect who should be able to find a home in the league, but if not, he has an economics degree and certainly a bright future ahead of him in whatever field he chooses. Whether politics might be in the cards remains to be seen, but as passionately as he feels about current issues, it wouldn’t be a surprise to see Cabinda go down that path in some capacity.